Robert E. Hollmann was raised in Lamesa, Texas. He attended Texas Tech in Lubbock, Texas on a football scholarship. He graduated from Texas Tech in January 1968 with a B.A. degree in history. In March 1968, he joined the United States Marine Corps, was commissioned a Second Lieutenant and served for one year as an Infantry Officer in Vietnam. He was honorably discharged from the service in December 1970. During his time in the Marines he was awarded nine decorations and commendations including the Purple Heart for wounds received in combat. In January 1971 he returned to Texas Tech where he received an M. A. in Government in 1972. From 1972 until 1981 he taught government and history and served as an administrator at Midland Community College, Midland, Texas. He earned a doctorate in education from Texas Tech in 1976. In 1981 he entered law school at Texas Tech and received his law degree in 1983. He taught at The University of Texas of The Permian Basin for ten years. He has served as a prosecutor and a Judge and currently has a private law practice in Odessa, Texas. He was selected for Who's Who Among American Teachers, 2005. His hobbies include sports, horseback riding, participating in the West Texas Roughriders western shoot-out group, and acting at the Globe of the Great Southwest and The Permian Playhouse in Odessa, Texas. 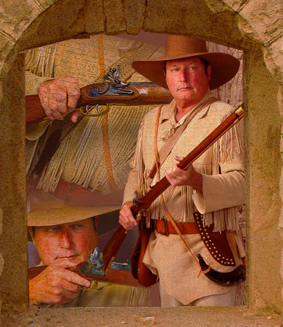 He has had four novels published, TEXAS REBEL, THE LAST COWBOYS, KING OF THE LLANO, and A BADWATER HOMECOMING and six books for children on Texas Heroes, DAVY CROCKETT, JIM BOWIE, JUAN SEGUIN, WILLIAM TRAVIS, SUSANNAH DICKINSON, and THE ALAMO. He has written a play, THE LAST BALL, which was first performed at the Globe of the Great Southwest in Odessa, Texas in February 2004 and again in September of 2013. He was selected Best West Texas Author for 2005 in a poll conducted by The Odessa American and Hastings Book Store for the DAVY CROCKETT book. In September 2009 his play, OH SUSANNAH, A TALE OF THE ALAMO, a musical based on his SUSANNAH DICKINSON book, was performed at the Globe of the Great Southwest in Odessa, Texas. His play, TOO TOUGH TO DIE, was performed at the Globe of the Great Southwest in September of 2013. His play, OUTLAW QUEEN was performed at the Permian Playhouse in September 2014. His play TOO OLD TO DIE YOUNG was performed at the Permian Playhouse in October of 2015. He is a member of the Cowboy Action Single Action Shooting Society and a Life Member of The Sons of the Republic of Texas. He was selected for the Heritage of Odessa Community Statesman Award for Arts in 2016.